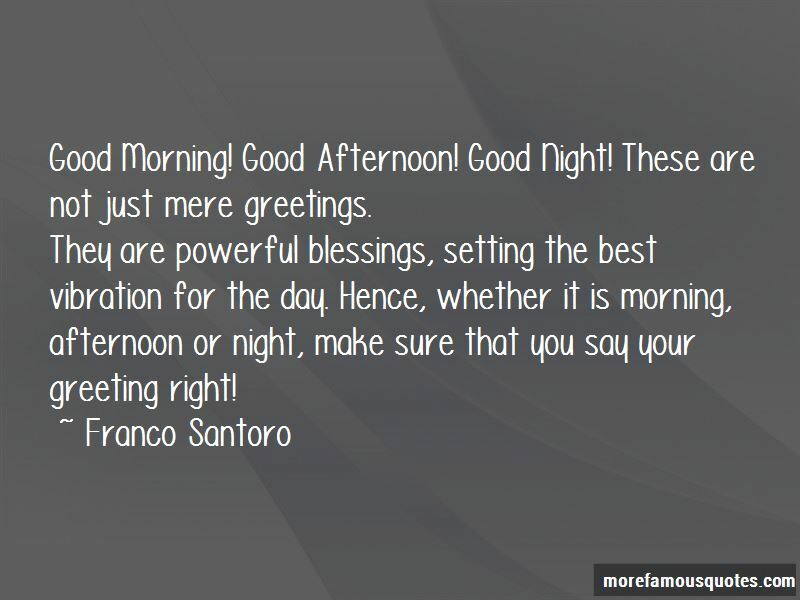 Enjoy the top 44 famous quotes, sayings and quotations by Franco Santoro. Every time we make assumptions about what other people feel, do or think, we imprison them and us in a separate reality. When we believe in those assumptions and act accordingly, this separate reality becomes an existential torture chamber for them and ultimately for us. All the terror and pain that we experience or see in the world is the result of our assumptions. Assumptions are the greatest crime in human consciousness. Hence let's start to create an assumption-free world. “Good Morning! Good Afternoon! Good Night! These are not just mere greetings. There are no shadows in darkness. Shadows are created by light, and only exist in the presence of light. Refusing to acknowledge our shadow leads us to deny the presence of light in us. She abandoned me. This was devastating. And the paradox was that the moment she abandoned me, she began to be with me at all times, constantly abandoning me wherever I would go, whatever I would do and with whomever I was. And the pain was unbearable. Hence, I decided to abandon everyone and everything, remaining with nothing, doing nothing and being absolutely alone. Well, the paradox is that she is still there! The time we need in order to heal our wounds and finally manifest our deepest dreams is only as long as the gap between two thoughts. These are thoughts in polarity, such as separation and unity, conflict and peace, misery and joy, hate and love, etc. Since as human beings we are all capable of experiencing both thoughts, the only skill we need to develop involves mastering the GAP. “Whatever is going on, whether there is pain or joy, light or darkness, separation or wholeness, accept it! The Sun and the Moon oppose each other on a Full Moon. The best time to finally be and do what you want could be the worst time to be and do what you want. So if now is the worst time for you, this may be your best chance. I believe now that no matter what we consciously believe to be our true destination in life, unless we explore them all, we will never find it. The search may continue forever, and sometimes the only way to take some rest, is to convince ourselves that we have finally arrived, till we realise that we cannot stay where we are anymore. Hence we look back at the whole life itinerary, scanning all routes, crossroads and roundabouts, searching for a missing dream. We acknowledge whether we turned right, left, went straight or back. And no matter how far in space and time is that crossroad, we will return there and choose otherwise. When happiness or pain reach their climax, we often believe that the journey is over. And yet I can assure you that this is the best moment to acknowledge which routes we did not take, which dream we didn't dream, and choose again. The key to become who you want to be is to understand and accept who you already are. Ordinary reality and human life is probably the most extraordinary development of all spaces and times. It shows and proves how the greatest fantasy and absurdity can be the only reality for billions of souls. The great gift we receive from our human reality, when we are ready to accept it, is the capacity to follow its example, allowing all our fantasies, even the most absurd, to become real. 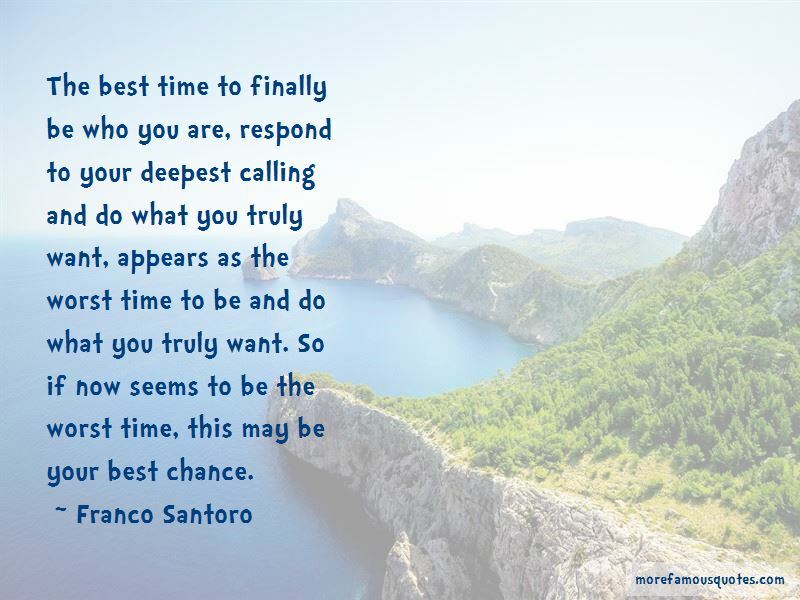 The best time to finally be who you are, respond to your deepest calling and do what you truly want, appears as the worst time to be and do what you truly want. So if now seems to be the worst time, this may be your best chance. “We are interested in what we love. We love what we are interested in. What we are interested in also loves us and is interested in us. “Whatever you dream be aware that it is just a dream. Yet, since there are infinite parallel universes, whatever you dream must be real somewhere in the multiverse. “The first step in reawakening our multidimensional nature implies the retrieval of our capacity to navigate through time, which means becoming aware that all experiences we have had in life continue to exist somewhere even if they are not apparently happening in our ordinary perception of time. Human beings could be defined as the keepers of a wall of separation dwelling at the threshold between dimensions longing to meet. As long as we insist being attached to the wall, these dimensions will keep on causing destruction and misery in our life. All human pain and troubles are basically due to our stubbornness in preserving this wall. It takes only a few seconds to acknowledge a smile full of love, and yet those few seconds can be a gateway into an eternity full of love. “At times life orchestrates a very efficent, yet rather painful, modality to allow us to release grievances and judgements towards some people. It consists in slowly setting the stage for us to be in the same circumstances, which eventually lead us to behave exactly like those people. 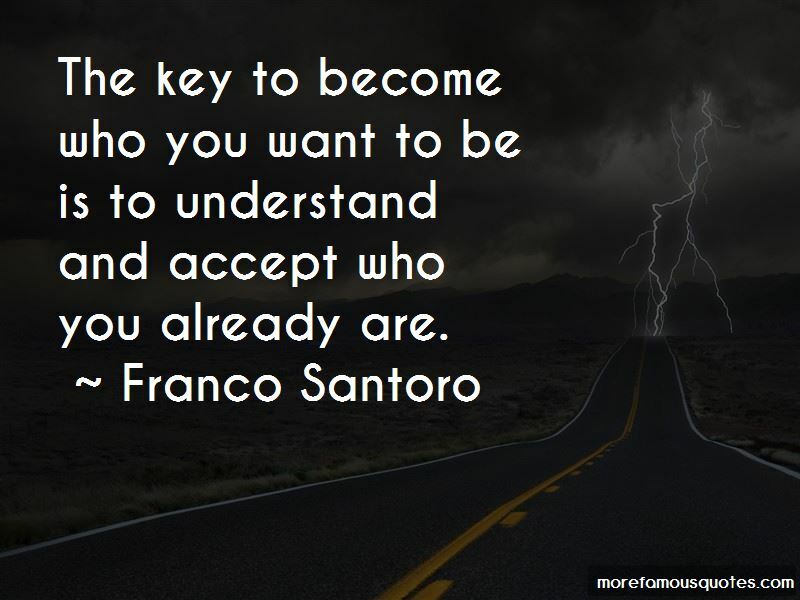 Want to see more pictures of Franco Santoro quotes? 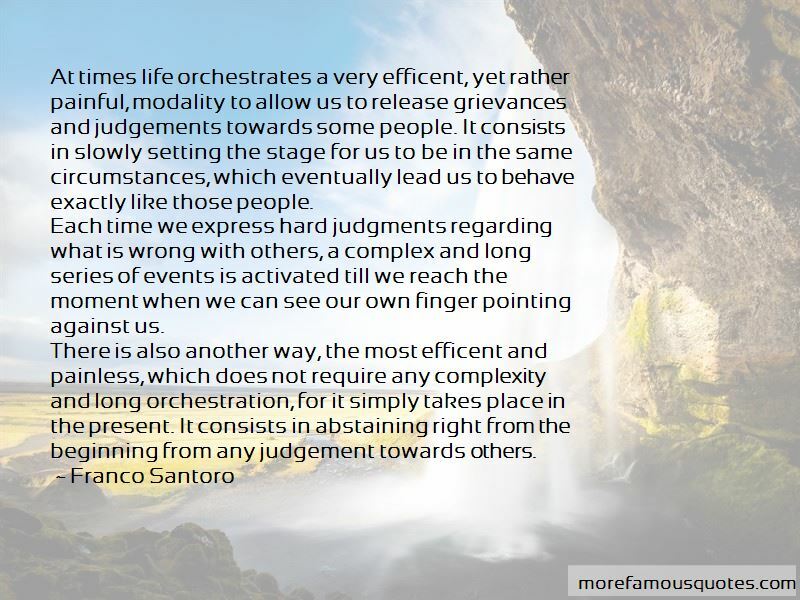 Click on image of Franco Santoro quotes to view full size.